Our Devotion to St Peregrine, O.S.M., patron saint of those suffering from Cancer and other serious illnesses. St Peregrine OSM was born in 1265 in Forli, Italy. When Philip Benizi (a Servite Friar and General of the Friar Servants of Mary) visited the town he was beaten up and driven out of the town by the people there, among whom was Peregrine. After the incident Peregrine, regretted the part he had played in the incident and sought out Philip to ask his forgiveness. Being met not with hostility but loving forgiveness Peregrine changed his way of living and he entered the Servite Order as a lay brother. 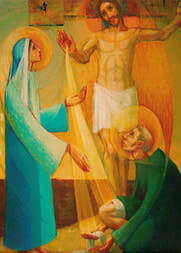 He developed his life of prayer and penance over the remainder of his life time. Due to physical penances undertaken by himself, Peregrine developed varicose veins when he was sixty years of age and, on his right leg, these became malignant. Amputation was thought to be necessary if his life was to be saved. On the night before the operation Peregrine dragged himself before the crucifix and saw Jesus descend from the cross to heal his leg. The following day, the doctor came to perform the amputation but could find no sign of the wound. He was shocked to see this and very soon the whole of Forli was talking about the great miracle that had taken place. Peregrine died of a fever in 1345. He was canonised by Pope Benedict XIII in 1726 and he is known as a powerful patron of those who suffer from cancer. His feast is celebrated by the Church on the 4th of May. The Servite Friars hold Masses of healing at each of their priories and commend their Servite brother to all who are in search of support and healing. Masses for the sick and devotion to Saint Peregrine are held at venues around England, Ireland & Scotland. Here at Ss Peter & Paul our parish priest Father Bill OSM is a Servite friar. Our next celebrations of Holy Mass and the Blessing with the Relic of St Peregrine is to be announced. The blessing with the relic is always available to those who wish to receive it for themselves or on behalf of others.